Previously we had a look at the iterator pattern. The mediator pattern is way different on what it tries to achieve. It is one of the behavioural patterns and its purpose is to alter the way objects communicate with each other. Instead of the objects communicating with each other directly the mediator will handle the objects interaction. For example imagine the scenario of a financial exchange. You do want to trade and buy but you don’t buy directly from the one that makes the offer. Instead the exchange is in the middle, in order for you to make the transaction. People would like to sell and buy. This shall be facilitated by the exchange. You got the order object. The next object would be the financial entity that sells the stocks. Then we create the exchange object. We won’t get further into commissions but imagine that things can be way more complex. The exchange is actually our mediator. And the last step is creating the trader object. As you can see the trader object is not interacting directly with the financial entity that provides the stocks. Let’s put them all together in a main class. That’s it, you just used the mediator pattern for an exchange application! You can also find the source code on github. We do use a lot of h2 with spring especially for unit tests. However instead of unit tests we might want to have a fully functional prototype with data to display. H2 is the perfect candidate for that, it works great with spring, it has good syntax compatibility with most databases out there and it also provides you with a ui to check your data. Imagine the scenario of an interview assignment. You want your example to work out of the box with as minimum as possible configuration for the reviewer. The plan is to have an application up and running with some data. Before accessing the application we might as well want to add some data to it. Then we need to have a proper way to display the data added without adding extra code. The first step is to go to the spring initializr and add the Web and H2 dependencies. Also we shall add the jdbc property. The end result will give a build.gradle file like this. Since we added the jdbc property we can have some schema scripts executed once the application is started. Thus we need to create a schema.sql file containing the sql statements which create the schema. The next step is to enable the h2 console. We will go with the yaml approach however you can do it either using a properties file or environmental variables. 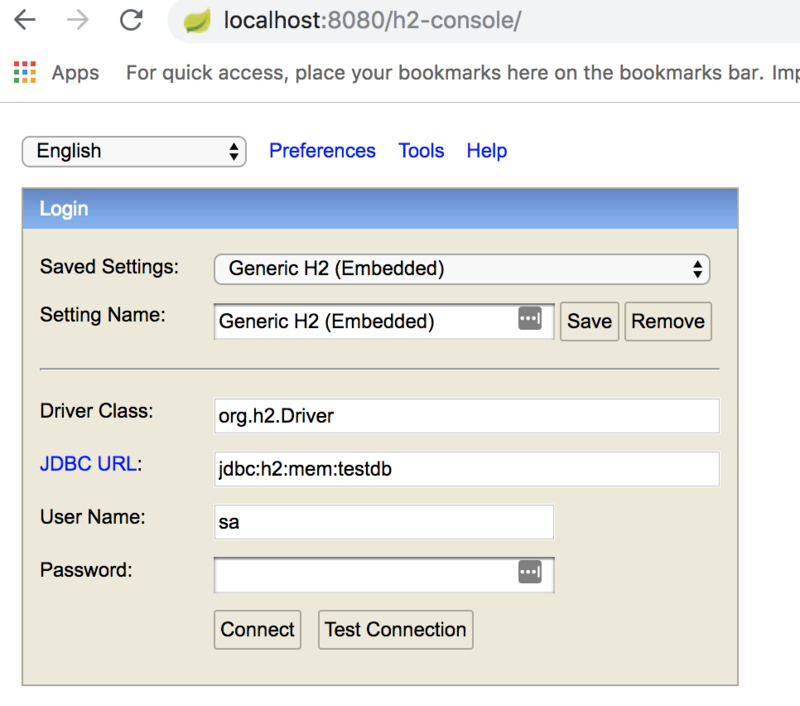 Now once we get our spring application running we can navigate at the http://localhost:8080/h2-console endpoint. Once we have logged in, we can query for the user we had inserted on our startup sql script. That’s it! This can make wonders for prototypes, interview assignments and blog posts like this! The iterator pattern is one of the most used patterns from the behavioural ones. Most of the times you use it without even noticing it. Supposing you have a container with elements and you want to traverse them. Iterating the elements might differ based on the container, retrieval method etc. By using the iterator pattern we can decouple the algorithms used by the containers, and the retrieval methods and abstract the iteration of the elements contained. For example when it comes to retrieving paged data from a rest endpoint the iterator can help you to abstract it. Therefore you won’t expose the user with any information on how you retrieve the next batch of data. I will make a new iterator interface similar the one provided by the java language. We will use the github jobs api since it is open to issue rest queries and search for jobs. The first page is page zero. We shall create a simple object which would contain the id, title and company information. Our first step would be to create a repository witch shall fetch the data of the page specified. What’s great with this api is that if you ask for a page that does not exists you get an empty json object, thus asking for a non existing page won’t give us an exception like 404, therefore no need for error handling for this case. Now the interesting part is the iterator. The iterator shall contain a page request from github. For each element requested one item shall be removed from the page. Once the page gets empty a new page shall be requested. Whether the user asks for another element or if another element exists the code shall check if the current page is empty and if yes it will request for the next page. If we got an empty page this mean that there should not be any extra request to the iterator. The next step would be to add a method to the repository which shall give back the github iterator. So let us sum up and iterate over all the entries. It is also worth referencing patterns we saw previously such as the interpreter, chain of responsibility and the command pattern. Previously we had a look at the chain of responsibility and the command pattern. They do tackle different problems however they both delegate an action to another component, the command patterns always delegates the action, the chain of responsibility if the action cannot be handled it will be forward it to its successor. We are going to switch context and check the interpreter pattern. The interpreter pattern specifies how to evaluate custom languages. The examples are limitless, for example the spel language for spring or even a sql like language. We will keep things simple and create an interpreter for a simple query language only with select and where statements. This is not impossible in the real world, just thing about dynamodb and how simple its expressions are, the examples are countless. So let’s start with our clause interface. * Add functions for expressions for equals not equals etc. The load function shall load our data based on the expression given. Both clauses are linked together however the select clause can produce results even when ‘where’ statements have not been given whatsoever. In any case when it comes to loading the data the select clause will check and apply any filter statements that the where clause might have (if exists) and then return the data. We will create the expression interface. The interpretation of the text given will give us back a clause. We shall create the WhereExpression. * Parse the string and find any where statements ie. A=1 AND B!=2 and apply them. * Parse text and check for expressions like `SELECT * FROM ` or `SELECT A,B,C FROM` . The last step would be the query expression. So let’s put them all together. We shall interpret a query which fetches a list of integers. We had a look on creational design patterns and structural design patterns. On this blog we will focus on behavioural design patterns. Behavioural design patterns are design patterns that identify common communication patterns between objects and realise these patterns. By doing so, these patterns increase flexibility in carrying out this communication. Creational design patterns realise the creation of objects. Structural design patterns provide ways to realise relationships with objects. Behavioural design patterns realise the communication between objects. The chain of responsibility pattern has to do with command objects being handled and passed to other objects by logic-containing processing objects. There are many examples that come to mind. One of them is road infrastructure issues which need to be handled by towns, municipalities or states. The towns should be responsible for its road issues, the municipality should handle the infrastructure that has to do with towns, hamlets and villages and the state all the rest such as urban roads, bridges etc. There are various road incidents pothole, accidents, the collapse of a bridge you name it. This brings us to the road incident model. The latitude and longitude are the coordinates. Based on the coordinates each geographical region should proceed or pass the incident to the next region. The next step is implementing the incident handler interface. Each geographical region should be identify if the incident is within its bound and should be handled by it. If not the incident should be forwarded to its successor. We should start with the state road incident handler. * Reverse geolocation, look up by name, radius based distance etc. So the state has no successor. It is the highest level, thus if the incident is out of it’s bounds then it will throw an illegal argument exception. Then we go to the municipality handler. The municipality handler does have a successor. It can be the state or something else we might come up in the future. If the municipality incident handler is not able to handle the incident then it will forward it to its successor. The last one is going to be the town road incident handler. The same rule that applies to the municipality applies to the town handler. If the incident is not within its bounds it will forward it to its successor. So the municipality’s successor is the state. Also the state is the successor for the second town. The first town has the municipality as the successor. Regarding the first town if the incident can be handled only by the state then it will be forwarded from the first town to the municipality and then from the municipality to the state. Regarding the second town if the incident cannot be handled it will be forwarded to the state. Previously we checked the adapter pattern the use cases and the bridge pattern. The pattern we will examine in this post is the composite pattern. By following the composite pattern we “compose” objects into tree structures representing part-whole hierarchies, therefore clients can treat individual objects and compositions uniformly. By referencing the word hierarchies the first thing that comes to mind is organisations. A military organisation is a great example for the composite pattern. One of the most basic actions of military personnel is to execute orders. Thus we will make an interface which specifies the ability to execute orders. The private is the lowest rank in a military organisation. A private cannot delegate a task or give orders. Therefore he will just execute an order. Above the private there are other ranks like Major, Lieutenant, Colonel etc. Those are officer ranks and officers execute orders but also they can assign orders. So the Officer interface will specify the ability to assign orders. Be aware that an officer in order to execute an order he will take some actions on his own and he might as well assign some orders to lower rank personnel. So the Lieutenant will be able to execute orders but also to assign orders to ranks lower that him. The same that applies to the lieutenant applies to the major who is able to execute orders and assign orders to lower ranks. In our scenario the general is the highest rank and thus when he assigns an order this order will be executed by the composite we implemented. And a main class will display the composite’s functionality. As you can see the general object, which is the client treated all the objects uniformly. The whole hierarchy is represented in a tree structure. The private is the leaf the major and the lieutenant represent the Composite that forwards the requests to the corresponding child components.